Jack Edwards is set to return for Brakes on Tuesday evening. 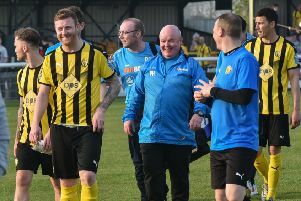 Leamington manager Paul Holleran says the lessons learned from last season’s mid-campaign blip will ensure his side continue to set the pace at the top of the Southern League Premier Division. Brakes went into last November just a point adrift of leaders Poole but by the New Year they were some 16 points behind after a wretched December and January. And with the memories of their slide down the table still raw, Holleran says every effort is being made to guard against a repeat. “From my point of view I’ve got to make us as strong as I possibly can,” said Holleran. I’ve got to make sure we have healthy competition for places. “With the players we had unavailable there would have been no way we could have gone to Frome and picked up a point (last season). “We’ve brought Richard Gregory in and the easy option would have been not to bring in players like that with Ryan Rowe back in training. “But when players see competition and see players who want their shirt you get a bit more. “Also we haven’t got the distraction of the League Cup and FA Trophy like last year and we’ve just got the league to concentrate on. Rowe will be pushing for a return at Kings Langley tomorrow after recovering from whiplash suffered in a car crash but Darren Pond remains a doubt. Jack Edwards will return for Tuesday’s home clash with Chesham after serving a two-match suspension.